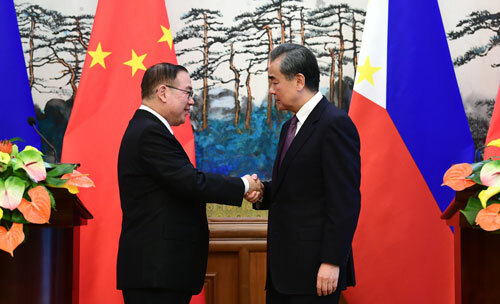 On March 20, 2019, after holding talks with Foreign Secretary Teodoro Lopez Locsin of the Philippines in Beijing, State Councilor and Foreign Minister Wang Yi told the Chinese and foreign journalists that China and the Philippines are not only brothers of good neighborly and friendly relations, friends with mutual trust, but also partners who develop hand in hand. Cooperation between the two countries is embracing the growth in quantity and leap in quality, showing a strong momentum of development. It brings more well-being to the two peoples and contributes significantly to regional peace and stability. 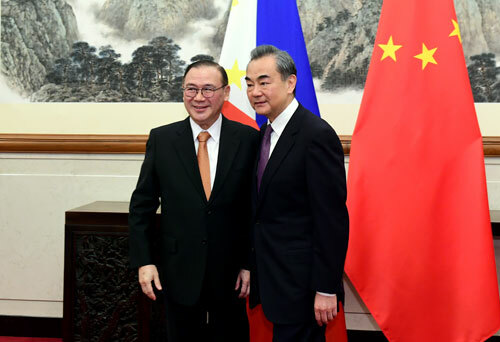 Wang Yi pointed out that just now, Foreign Secretary Teodoro Lopez Locsin and I not only reviewed the important progress over the past three years since the turn-around in China-Philippines relations, but also reached broad consensus on bilateral high-level exchanges and cooperation in various fields in the next phase. We agreed to take the important consensus reached by the two heads of state as guidance to constantly push China-Philippines relations to news stages, and focus on promotion in four aspects in the next step. First, promote cooperation under the Belt and Road Initiative. The Philippines is an important hub on the Maritime Silk Road, and a natural partner in jointly building the Belt and Road Initiative. Next month, President Rodrigo Duterte will attend at invitation the second Belt and Road Forum for International Cooperation (BRF) in China, and it will be the second time for him to attend the BRF in China. This fully shows that the Philippine government and President Rodrigo Duterte highly value and support the Belt and Road Initiative. The two sides decided to forge three highlights under the framework of cooperation in jointly building the Belt and Road Initiative. First, make the two major cooperation belts of Luzon in northern Philippines and Davao in southern Philippines strong. Second, build the industrial park in New Clark City into a model of trilateral cooperation. Third, strengthen cooperation between China and the East Association of Southeast Asian Nations (ASEAN) Growth Area, and cooperation in the construction of the New International Land-Sea Trade Corridor. All of these will deepen the integration of development strategies of China and the Philippines as well as various countries in the region, and bring broader development prospects for mutually beneficial and win-win cooperation. Second, promote maritime cooperation. Under the joint efforts of China, the Philippines and other countries in the region, the situation in the South China Sea has notably cooled down, and cooperation aspects have continuously increased, with the constant growth of positive factors. Early next month, China and the Philippines will hold the fourth meeting of China-Philippines Bilateral Consultation Mechanism on the South China Sea. Both sides will promote maritime dialogue and cooperation for more progress. The Code of Conduct in the South China Sea (COC) is a regional regulation for China and the ASEAN countries to jointly safeguard the peace and stability in the South China Sea, as well as an updated and enhanced version of the Declaration on the Conduct of the Parties in the South China Sea (DOC). The Chinese side will, together with the Philippines and other ASEAN countries, stay focused and eliminate interference, strive to complete the negotiation on the COC before the end of 2021 and enable the COC to earnestly play the role as a stabilizer in the South China Sea. Third, promote East Asia cooperation. The Chinese side values the Philippine side's important role as the country coordinator for China-ASEAN relations, and will actively support the Philippine side in fulfilling its obligations as the country coordinator. The Chinese side will strengthen communication and coordination with the Philippine side to promote the improvement and upgrade of China-ASEAN relations. At present, both sides should concentrate on speeding up the negotiation on Regional Comprehensive Economic Partnership (RCEP) to facilitate the connectivity and development of the whole region, and better achieve the common development and prosperity of regional countries. Fourth, promote multilateral cooperation. Currently, multilateralism is faced with challenges and protectionism is on the rise, posing severe challenges to countries like China and the Philippines that yearn for peace and development. As emerging economies in Asia, China and the Philippines are ready to make joint efforts to enhance cooperation and coordination in international and multilateral affairs, jointly safeguard the international system with the United Nations as the core, maintain the rules-based global trading system, and preserve the international law system with unilateralism as the principle.